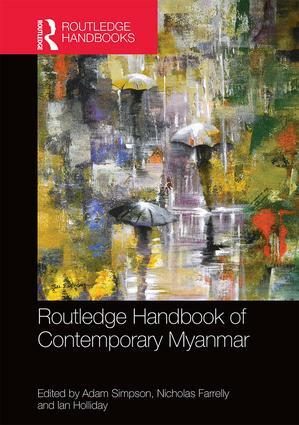 The Routledge Handbook of Contemporary Myanmar has recently been published, edited by Adam Simpson, Iain Halliday and Nicholas Farrelly. It was great to be a part of this collaborative effort. Abstract as follows: This timely Handbook describes the political, economic, and cultural dimensions of this crucial period of transition in Myanmar. It presents explanations for contradictory trends, including those that defy some of the early narratives about the comprehensive transformation of Myanmar. The Handbook also considers the impact of major environmental, strategic, and demographic trends which help underscore that Myanmar’s development will be an ongoing task. In addition to introductory and concluding chapters by the editors, the body of the Handbook is divided into seven core sections: • Fundamentals • Spaces • Cultures • Living • Governance • International • Challenges. Written by an international team of scholars, with a mix of world-leading established academics and talented emerging researchers, the Handbook provides a rigorous scholarly overview of Myanmar’s politics, economics, and society. As Myanmar opens to Western businesses and government agencies, this is an invaluable reference book that will provide a foundation for further research and offer the first port of call for scholars, students, and policy makers working on Myanmar and Asia.